This is the book that sparked the idea for this unit. We'd been reading Bob Barner as part of our Reading Our Library project and Jonathan really liked this book. In this book we're introduced to eight different bugs and told a short fact about each one. The rhyming verse and colorful collage illustrations make this book quite fun. At the end, the reader is shown bugs drawn to scale as well as a chart comparing each bug. 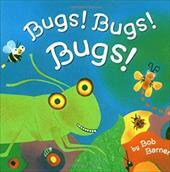 It's a super toddler-friendly introduction to bugs that older children should enjoy equally well. This was another fun read. Pallotta's book introduces different insects and other creatures from A-Z. As we progress from ant to zebra butterfly, we learn different characteristics and actions these creatures make. An interesting fact I learned is that although we call all of these creatures "bugs" apparently they are all "insects". I thought the terms were synonymous, but I was wrong. Anyhow, this book is full of interesting facts and held Jonathan's attention well. He had fun trying to identify the insects before I told him what they were. This is part of a series of books called MathStart. The books are designed to introduce math to preschoolers in a fun and engaging way. This particular book is about comparing sizes. It covers the concepts of "big/bigger/biggest" as well as "small", "long", and "short". There's a review page after each concept is introduced and the end of the book provides helpful extension activities. As far as plot, there isn't much of one besides a ladybug comparing herself to different bugs. In the end, all the bugs join the bug parade. It's worth checking out, if you're looking for a good math concept book. Jonathan engaged with the review pages and told me what he thought each bug was. I'm linking up to Read-Aloud Thursday over at Hope is the Word. Head on over there to find more great read-aloud treasures! Oh, I love those MathStart books! We've read quite a few of those. And The Icky Bug Alphabet Book is a sentimental favorite of mine because I first bought and read it way back when my almost thirteen year old nephew was a preschooler. Sweet! I'm so glad you linked up this week! I love the Carle book already. I'd love to get my hands on the bugs, bugs, bugs because of the vibrant colors. Thanks for sharing.